When it comes time to shut off the water to a sink or toilet you will often find that since the valve has been sitting so long it may not work according to plan. This is when you might decide to replace a shut off valve. Identifying which type of valve you have is a good first step in replacing it. Knowing what types of valves are available is another thing that can make the process easier. Straight stop valves are normally found when the water line comes up from under the house through the floor and the feed pipe goes straight through the same line as the outlet. The handle of a straight stop valve will come straight out in the middle so that it is easy to get to. Angle stop valves are normally used when the water line comes out from the wall and the outlet side of the valve will be perpendicular to the inlet side. The handle of an angle stop valve will be parallel to the wall and usually faces the front for easy access. Three-way stop valves have an inlet and two outlets. These are often seen under kitchen sinks to feed both the hot side of the faucet and hot to the dishwasher at the same time. Three-way stops can come in a few different configurations. Compression stop valves are most commonly used to install a shut-off valve on copper tubing. This type of shut off valve compresses a brass ferrule onto the copper with a nut holding it tight into the shut-off valve. Compressions valves are easily installed with a pair of pliers or wrenches. Compression stops can be removed and changed although sometimes it is hard to get the old nut and ferrule off the pipe, so there is a specialty tool (a compression sleeve puller) for this. This type of shut off valve needs to be soldered to the copper tubing. Soldering tools such as a torch, flux, sand cloth, and solder will be required. Sweat valves are not easily removed once they are installed because they have to be sweated back off. Iron stop valves are screwed on to iron pipe size threads. This type of valve is commonly found on galvanized or brass threaded pipe, but they can be converted from any type of pipe by using a male iron pipe adapter that connects to the pipe and then screws into the shut-off valve. This valve is a safe fitting for any type of pipe. The ability to unscrew the shut-off valve to change it makes it handy. 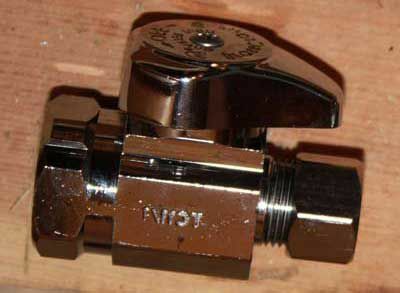 The only tools required for this type of valve is two pliers; one to hold against the pipe and another to tighten it. This type of shut off valve has a CPVC insert, like a coupling that can be glued onto CPVC pipe, and a gasket and nut that screws into the valve. No special tools required just glue and some pliers. Once the valve is glued on the CPVC insert piece has to be cut off to be removed, but you can unscrew the nut and gasket and replace the valve with the same type of valve without cutting off the glued insert. PEX stop valves can be removed but you have to cut the ring off. This often results in damage to the pipe which usually means the pipe needs to be shorted to get another good section of pipe for the new valve. They do make push fit shut off valves which are the easiest to install as long as there is enough pipe showing. Push-fit shut off valves just push onto the pipe until they lock into position, sealing through an o-ring and staying clamped on with a barbed fitting that will not let the pipe back out. Push-fit shut off valves can be used for copper, PEX, CPVC, and even the old gray quest (Polybutylene) pipe because it has the same outside diameter as the other pipes. Often removing push on fittings when they need to be replaced is easy.